Biella is a town in the northern Italian region of Piedmont. It is about 80 km from both Turin and Milan . It lies in the foothills of the Alps, an area rich in springs and lakes, the heart of the Biellese Alps through which several mountain torrents flow: the Elvo to the west of the town, the Oropa and the Cervo to the east. Nearby areas of natural beauty and tourist attractions worthy of note include the Zegna Viewpoint, the Bielmonte Ski Resort, Burcina Nature Reserve, and the moors to the south of town. The Sanctuary of Oropa is a site of religious pilgrimages. In 2003, the Sacred Mountain of Oropa was included by UNESCO in the World Heritage List. Biella is located at the foot of the Biellese Alps at the mouth of three streams: the Oropa, Cervo and Elvo streams, at an altitude of 420 meters above sea level. In 1379 the city and its destiny was put under the dominion of Savoy. The city flourished thanks to the establishment of industries transforming Biella into one of the major wool manufacturing centers of the world. Departing from Turin, our first stop will be Piazza Duomo where we’ll admire S. Stefano Bell Tower, the Ss. Trinità Church, the Baptistry and S. Maria in Piano Cathedral. Our tour will continue to Piazza Vittorio Veneto, where we’ll find the Fountain of the bear and Alfonso La Marmora Statue. 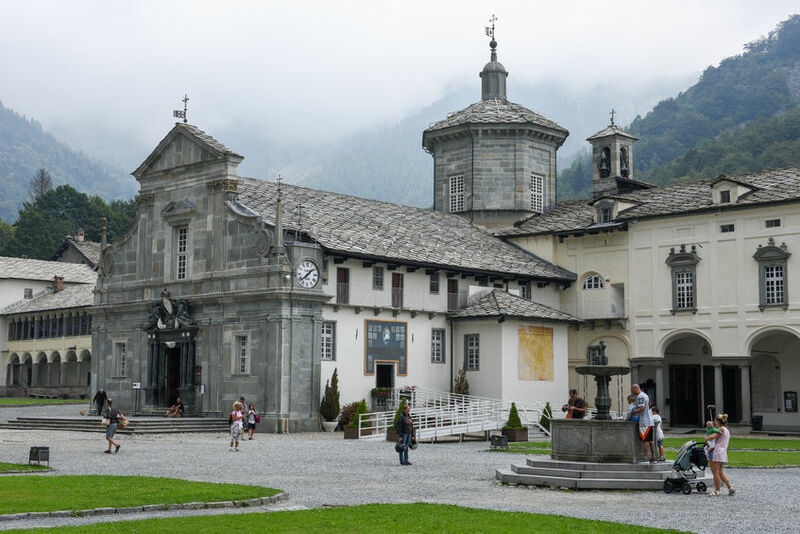 We’ll proceed to the S. Sebastiano Church and we can agree to visit the Museum of Territory. Not so far from the city center we can admire the San Gerolamo Monastery, a wonderful example of Renaissance architecture, we can have a walk through the Burcina Felice Piacenza Park and then we can visit the Sanctuary of the Black Madonna of Oropa, located at an altitude of 1180m , a beautiful sanctuary in the mountains above Biella , "Sacro monte " is a religious site comprising a group of chapels dating back to the late 16th and 17th. Walking and hiking in a spectcular and pristine alpine enviroment, we enjoy splendid views of the sanctuary. We can agree to have lunch in one of the typical restaurant of the city.